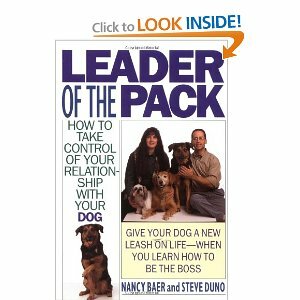 Leader of the Pack is an excellent resource for those who are involved in Greyhound adoption and who deal with behavioral issues. It is a ‘must read’ for anyone dealing with an aggressive or dominant dog. Dogs who growl, snarl, snap at or bite family members or strangers may end up being returned to the placement group or even euthanized. In many instances aggressiveness or dominant behavior can be eliminated if the adopters assume leadership behavior. Each chapter opens with a vignette of wolf pack behavior and an explanation of how it relates to the instincts of their canine cousins. The dog remains instinctively loyal to an autocratic leader, as does the wolf, but the dog belongs to a pack of humans. The wolf/dog analogies make it easy to understand why a dominant dog should not: be fed before the owners; sleep on the couch or bed; go out doors first or pull on lead; jump up on people; play tug games. Leader of the Pack explains five categories of aggression: genetic, fear based, territorial, competitive, and possessive. The authors stress the need for basic obedience training as a foundation for establishing leadership with a dominant dog. Their recommendations for further behavioral modification are outlined step by step in their book and are non-confrontational and easy to follow. Dominant dogs train their owners to give them what they want. Greyhounds as a breed are not known for human aggression. By making a dog the center of attention, we communicate to the dog that he or she is dominant because only a leader would be the center of attention. The dog perceives that it has the authority to discipline other pack members, i.e., family members, in an aggressive manner. The authors of Leader of the Pack acknowledge that many owners of dogs who exhibit aggressiveness are in denial or are ignorant of the consequences of this behavior. If you or anyone you know has a dog that is allowed to share the couch or bed and growls when approached, the advice dispensed in this book is greatly needed, especially before the dog’s aggression escalates. As the dog perceives the owner becoming more of a leader, the dog will become more secure, confident, and obedient and will interact more positively with people: a win-win situation for all. Even if you are not dealing with dominance issues with your dog, you will learn a lot about the psychology of dog behavior from reading this practical, easy to read book.